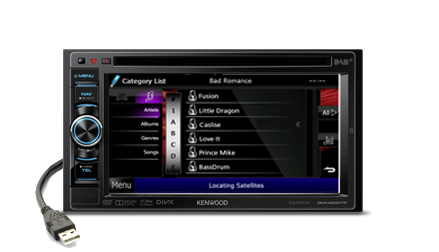 Kenwood’s best selling all-in-one multimedia unit comes with Digital Radio and has many of the features of its more expensive siblings with a slightly smaller 6” LCD touch control screen. 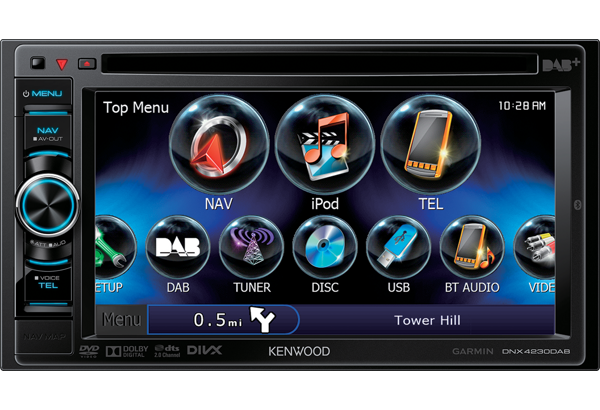 Designed to be extremely easy to use despite extensive features including Parrot Bluetooth, Garmin full European navigation, DVD/CD playback, iPhone/iPod direct control. 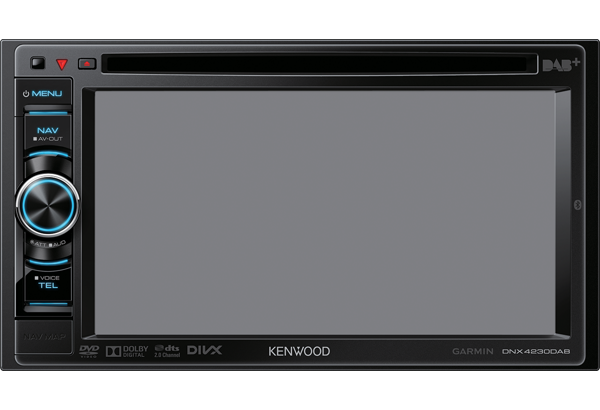 On an aesthetic notice full colour variable illumination for both the display and the control knobs can be set to match your cars dashboard illumination perfectly. 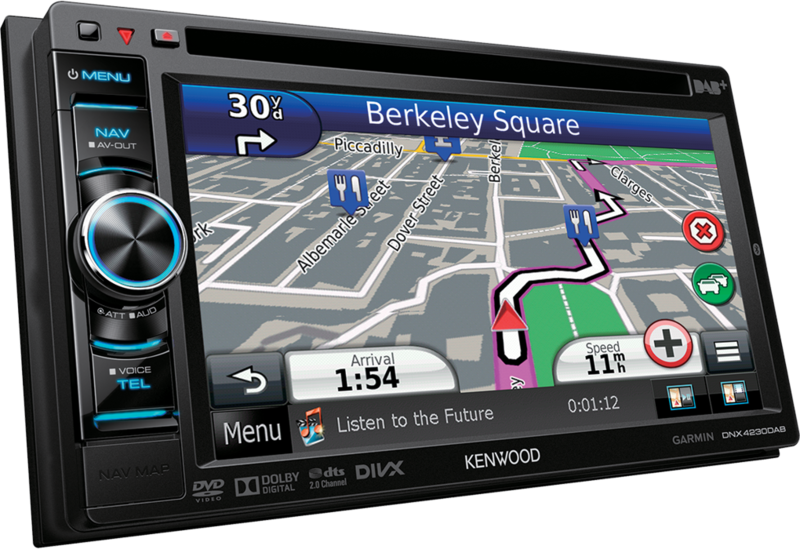 The KIA multimedia system comes complete with full fitting kit and steering wheel control interface from your local KIA Dealer. 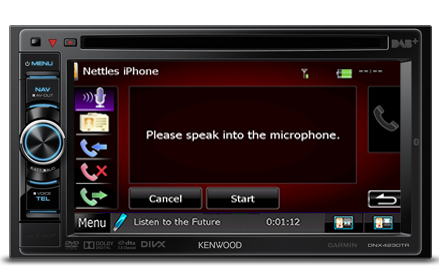 TTS function reads out not only directions, but also the street names during voice guidance when making a turn. This function is compatible with 9 Languages including English, Dutch, French, German, Italian, Norwegian, Portuguese, Spanish and Swedish. 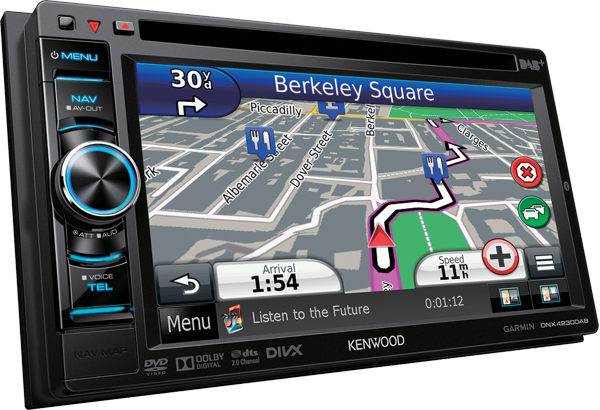 Over 2 million POIs are installed as standard in the navigation. These cover; ATMs/Banks, Food/Restaurants, Superstores, Sports Venues, Hotels, Petrol Station, Motorway Services and much more. Customised POIs can be added at your discretion including Safety Camera Database. You can add a safety camera database to the system. Download the PDF here for details of how and what you need to do. NB: These instructions suggest the use of third party software and database. 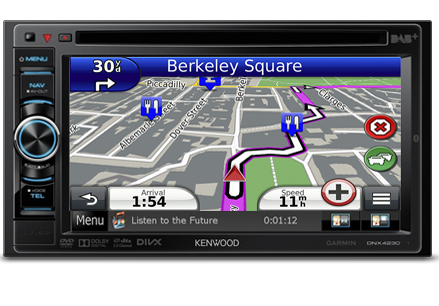 Kenwood Electronics UK Ltd does not support, or accept liability for, this software. 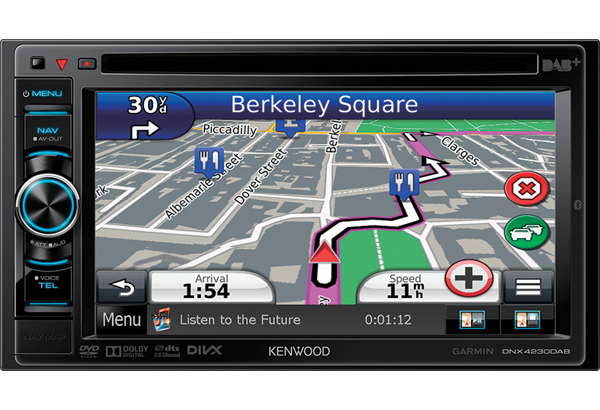 This database is provided by Pocket GPS World which requires a yearly subscription fee and updates are available approximately every month. 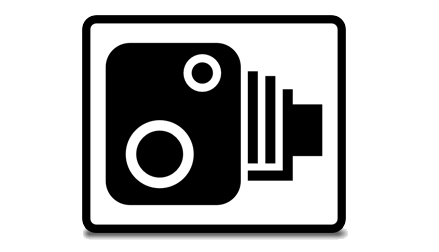 In some countries the use of safety camera’s are prohibited please check the legality of using any safety camera database in each country beforehand. This feature guides you to the correct lane for navigation, avoiding confusion on the motorway and multi-lane junctions. 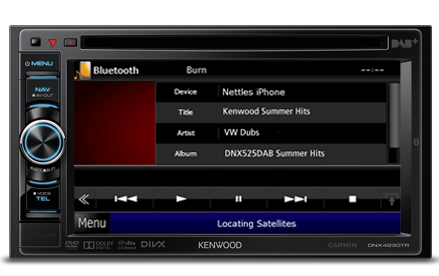 With this system you can get your favourite FM/AM stations on digital, as well as lots of digital-only stations. 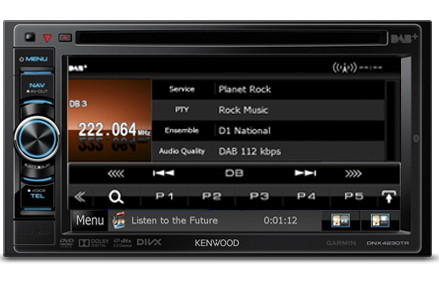 Digital radio has something for everyone. 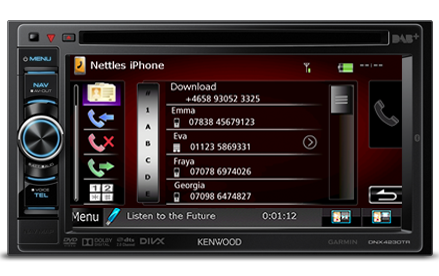 Kenwood have included an easy ABC service search which has swipe graphic control. This list is automatically populated at first unit power on. There is a list refresh button for when you venture out of your home service area and want to refresh this listing. Following a station selection you can choose to return to the main station display screen with full information read-out. 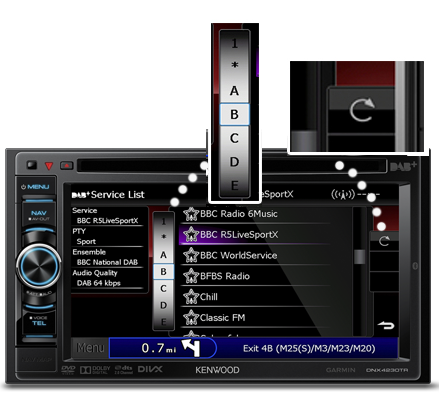 The system also has FM/LW/MW for those stations which are not available yet via Digital Radio. Equipped with built-in Bluetooth capability to enable hands-free mobile phone operation so you can keep your hands on the steering wheel where they belong and concentrate on the road ahead. - Making calls from phonebook. The system will allow the voice dialing feature found on most smartphones to work through Bluetooth. This features depends on the capabilities of your particular smartphone. 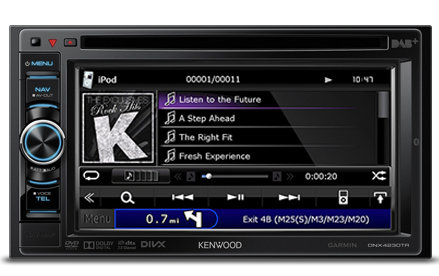 Easily stream music from your phone or other Bluetooth devices directly to the system. Functions such as track name display and track back and forwards are also available. Searching for music or a movie title is easy via the touch panel. In addition to conventional searches for playlists, artists, albums and genres, additional search commands can also be performed for music videos, TV shows, movies, video playlists, etc. NB: Video playback is only available when the handbrake is applied. When using iPhone5/5C/5S/6/6+ due to the phones capabilities it is not possible to playback videos. Optional iPod/iPhone lead required via your vehicle retailer.